Keisuke Tonkotsu King @Orchid Hotel (Singapore) | Get Your Grub On! Oh yes, it was that time again to meet my ramen buddy together with two visiting friends, this time at Keisuke Tonkotsu King at the Orchid Hotel in Tanjong Pagar. We rocked up around 8:30 p.m. and where super positively surprised that within ten minutes we already made our way inside. While waiting I filled in the form for my usual ‘Black Spicy Tonkotsu King‘ which arrived just one minute after sitting down. 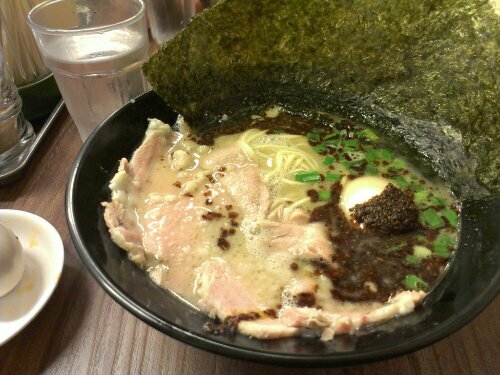 The broth was thick and had a strong porky taste to it which was boosted by the black pepper garlic and chicken oil. It was mildly spicy so the taste wasn’t covered up but for me it could have been a notch sharper. Did I already mention the egg? It was outstanding. I did let mine sit in the broth for a bit so it warmed up slightly from the outside and when biting into it I reached the cold but perfectly waxy yolk which together with the broth tasted amazing. I never thought I could say something like that about an egg. Coming to the Chashu now which they cut in big thin slices and artfully marinate in red wine. I wished I had a leaner piece but the meaty bits were juicy and tender and just did fit to this bowl naturally. Last but not least the centerpiece of a noodle soup – the noodles. I ordered them ‘hard’ and for many people those might be slightly too al dente but as you often get rather squashy noodles i really liked their bite and texture a lot. I don’t come here very often because the long wait one has to bear so I always think I might idealize this place too much but every time they delivery the same high level of quality in their food and not once I had overcooked noodles, a hard boiled egg or chewy chashu. Keisuke, still my king of ramen shops in Singapore. ‘Kaedama please’.